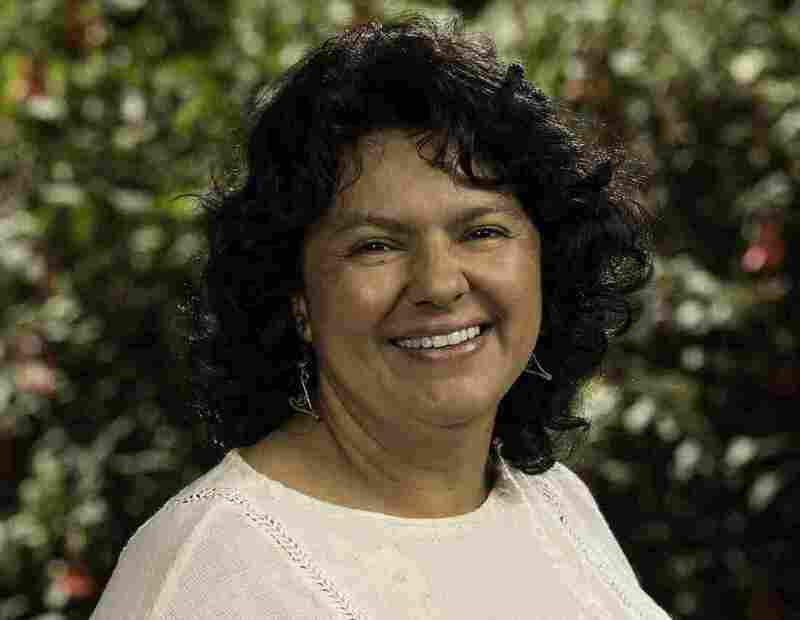 Berta Cáceres, Honduran Indigenous Rights Leader, Is Murdered : The Two-Way The InterAmerican Commission for Human Rights had called on Honduras to give Cáceres protection. Local media cite police as saying she was killed during a robbery at a house they were not guarding. Berta Cáceres was awarded the Goldman Environmental Prize in 2015. Berta Cáceres, a hugely influential Honduran indigenous rights activist, was killed in her hometown of La Esperenza, Intibucá, on Thursday. She would have turned 46 tomorrow. Cáceres was awarded the Goldman Environmental Prize after she led a peaceful campaign to stop one of the world's largest dam builders from pursuing the Agua Zarca Dam, which would have cut off the ethnic Lenca people from water, food and medicine. La Prensa of Honduras reports that Cáceres was currently working to stop a company from building a hydroelectric dam on the Gualcarque river, which the Rio Blanco community said would fundamentally change their way of life. Authorities, the paper reports, said she was killed during a robbery, but her mother said that Cáceres was killed "because of her struggle." Cáceres had faced threats for her environmental activism. So much so that the the InterAmerican Commission for Human Rights had called on the government of Honduras to provide her with protection. La Prensa reports that police say Cáceres was killed at a house they were not surveilling. "We were protecting her old home at Villa El Calvario, but she had not reported this new house to authorities," Police Commissioner Sergio Paz Bueso told the paper. Cáceres' family is calling her death an assassination. "They were waiting for the chance to get to her," Silvio Carrillo, her nephew, said in a phone interview. "They were just waiting and she knew it was gonna happen. We all knew but we didn't dissuade her because we believe in this too." "In the last few weeks, violence and repression towards Berta, COPINH, and the communities they support, had escalated. In Rio Blanco on February 20th, Berta, COPINH, and the community of Rio Blanco faced threats and repression as they carried out a peaceful action to protect the River Gualcarque against the construction of a hydroelectric dam by the internationally-financed Honduran company DESA. As a result of COPINH's work supporting the Rio Blanco struggle, Berta had received countless threats against her life and was granted precautionary measures by the InterAmerican Commission for Human Rights. On February 25th, another Lenca community supported by COPINH in Guise, Intibuca was violently evicted and destroyed." In a tweet, the Goldman Prize said it was "devastated to hear of Berta Cáceres' assassination." Annie Bird, who supported Caceres' actions for more than a decade, says her murder will have a chilling effect on other activists. "It sends a very strong message," she said. "And it makes everybody feel very vulnerable." Carrillo said he doesn't expect justice. Honduras, he said, is too far gone for that. "But what I do see is people being inspired to speak up and to push forth and to stand up and say we can't do this anymore," he said. "We can't have this happen anymore." Cáceres is survived by her four children — ages 26, 24, 23 and 21 — and her mother.